Life & Beyond : THE MAHATMA WILL ALWAYS REMAIN THE CONSCIENCE OF HUMANITY.. THE MAHATMA WILL ALWAYS REMAIN THE CONSCIENCE OF HUMANITY..
Mahatma Gandhi will always remain great because he was one among us – and he will always remain ‘the one’ among us. And for that reason – and for that reason alone – October 2 will remain the universal day of humanity – not just in India – but across the world. And the world is celebrating this spirit – the UN has declared October 2 – the birth anniversary of the Mahatma – as the ‘International Day of Non-Violence’. Yes, non-violence is the only universal principle that can guide the humankind to an egalitarian world – where each human life has same scalability. And non-violence is the only guiding principle that can ensure equal distribution of opportunities to each human life. The Mahatma will always remain great because we know the world, in spite of realizing the ‘inevitability’ of non-violence, has failed to build a ‘humanitarian world’. History of human civilization is replete with violence – men killing men. The world is still plagued with ‘man-created’ violence in many parts of the world. The modern day world – with its contemporary times – is best chance for humanity to aspire for a world of ‘universal humanity’ – and that world can only be built by eradicating wars and other forms of terror. But, in the prevailing geopolitical circumstances, that looks a ‘far-fetched’, hypothetical concept. Well, when the Mahatma had started practicing non-violence, first in South Africa and then in India, to oppose, and then to uproot the mighty British Empire, people had dismissed him first. Gandhi used to be a subject of mock initially. And we all know the might of ‘Satyagraha-non-violence’ today. It was the might of ‘Satyagraha’ only that could ‘successfully’ take on the might of British Empire. We recently witnessed this ‘might’ again – not just in India – but in many parts of the world. The underlying theme of every mass protest in the recent history – the global ‘Occupy’ movement, the Arab Spring, anti-corruption movements of India and Pakistan, universalization of Guy Fawkes masks as the symbol of mass protests – has been the principle of non-violence. Strengthening democracies and minimizing wars are the basic needs of the day – and non-violence is the basic tenet, the guiding conscience behind every such thought process. 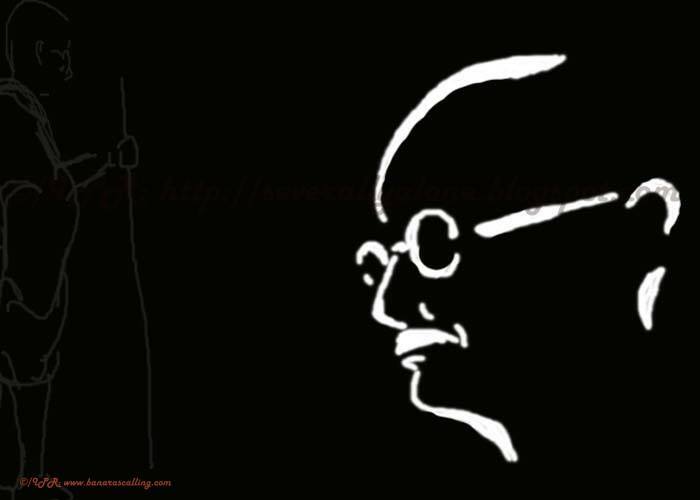 And life the Mahatma is its best manifestation – and a robustly functional Indian democracy is the best tribute to him.